Commercials settings should be cleaned thoroughly and per a strict schedule. 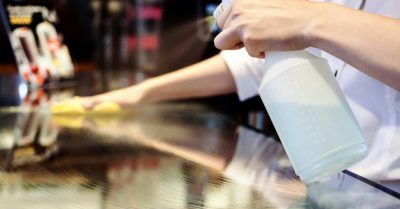 It is essential that the cleaning products use for commercial cleaning are not dangerous to the health and well-being of the visitors, vendors, clients, and employees. Green cleaning products ensure that the rejuvenated clean ambiance is maintained through environment friendly practices. Learn about the benefits of using green cleaning products for your commercial carpets, flooring, and other contact surfaces. The fibers and padding of the commercial carpets in the retail stores, hotels, restaurants, manufacturing facilities, and offices plays an important role on the health of the individuals who encounter it. Green cleaning products do not just extricate dirt and debris out, they also ensure that chemical residues are not left behind. Green treatments keep the exposure to abrasive chemicals negligible. Green seal certified products contain fewer chemicals. In fact, non-toxic and biodegradable agents in the products can be decomposed without causing air and water pollution. Without the traditional cleaner components, green cleaning products still manage to complete the tasks. The chemical run-off after the commercial cleaning has been done is also minimal. You may not be aware of it but the volatile organic compounds emitted from the commercial disinfectants and cleansers have detrimental health effects. These compounds may cause kidney issues, respiratory diseases, and liver problems. On the other hand, green sealed products make sure that the indoor air quality is improved and the commercial environment is not hostile for the employees and customers. Green products ascertain that the triggering causes of asthma attacks are mitigated through commercial cleaning without chemical allergens. Proper application of the disinfecting cleaning products controls the proliferation of germs. Green sealed products are safe to handle and the commercial cleaning professionals undergo professional training regarding the usage. Green cleaning practices also encourage the use of dilution dispensers for efficient handling. The storage of these products is also safe. These products are designed to be used by the powered heavy-duty commercial cleaning equipment securely. Do you know what’s hiding in your commercial cleaning products? Many commercial non-green cleaning products have hidden chemicals that could be harming you! See a list of common household cleaners that conatin hidden toxins by clicking HERE! It is easy to overlook packaging when it comes to promoting a healthy environment. However, green cleaning products are packaged in containers composed of recycled raw materials to save resources. Not only is the cleaning agent eco-friendly, the packaging is also biodegradable. Green cleaning is an effective way of keeping the commercial setting free of contamination. While you should take steps to keep your commercial flooring clean, the methods used to disinfect should also be considered. At Extra Hands Services, we make use of green seal certified products to remove the pathogens from industrial, manufacturing, medical, and other commercial settings. You may contact us at 8163966234 for more information about our services and products.